For added convenience and ease of use, Invertek Drives has designed a range of compact and robust IP55 & IP66 rated enclosures. With standardised levels of ingress protection, they provide a reliable solution to motor control in wet and dusty workplaces. Protected from objects > ∅12mm (e.g. fingers). Built with tough polycarbonate plastics specifically chosen to withstand degradation by ultra violet (UV), greases, oils and acids. Also robust enough not to be brittle at -20°C. Tough ABS case and corrosion resistant heatsink gives total reliability in wash down applications using strong water jets. Switched models include a potentiometer for speed control; power switch with safety lock; plus start/stop and forward/reverse buttons for instant, accessible control. Total reliability in dusty, harsh environments allows the IP66 rated drives to be located exactly where needed, minimising cabinet and cabling costs. Intuitive touch panel controls allow fast drive set up and adjustment. 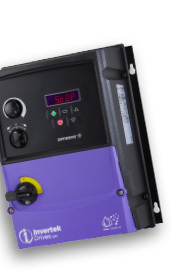 The robust IP66 enclosure provides excellent protection for personnel whilst the lockable power switch option provides reliable machine lock-off during maintenance. Limited ingress. Protected from harmful deposits of dust. Protected against low pressure jets of water. IP55 rated drives are protected from low pressure water jets and dust so can be installed in-situ, using minimal cabling. Save money and space by eliminating the need for additional control cabinets. 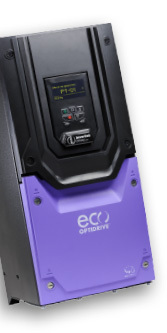 IP55 protected drives increase safety by keeping live parts enclosed and are more ergonomic, with accessible and easy-to-use on-drive controls. Installing drives closer to motors simplifies wiring and installation and means that equipment can be more easily moved and re-configured, if required.